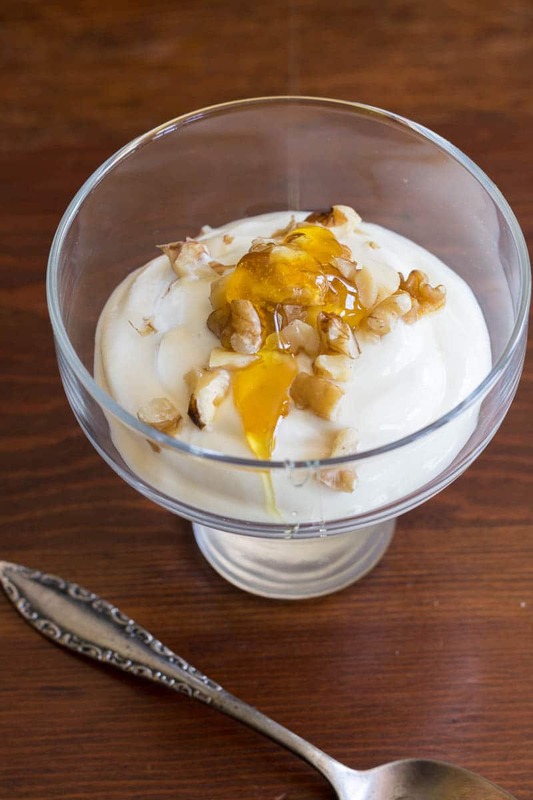 Get ready for a flavor sensation when you take a bite of Honey Tangerine Yogurt with Walnuts! Thank you to Noble Juice for sponsoring this recipe. Sometimes, a simple combination of flavors can take you by surprise. 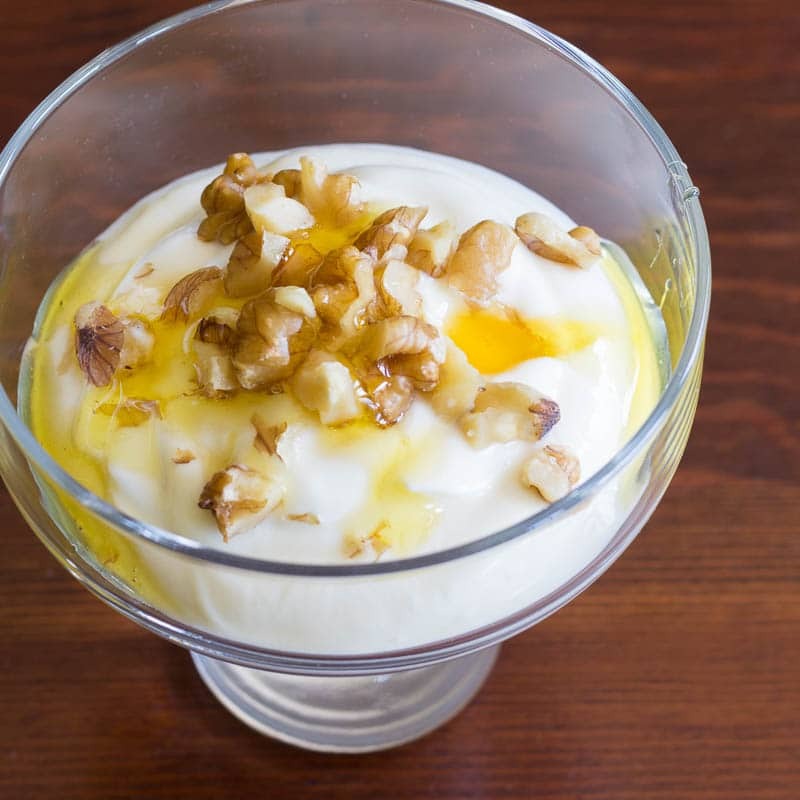 Of course I expected this yogurt to be quite tasty, but I was stunned by what a magical combination came from just a few ingredients: Greek yogurt, honey, walnuts, and tangerine juice. It’s so multidimensional in taste that you could easily serve it as a dessert. You would think it was incredibly indulgent because it tastes bright, silky, rich, and sweet. In fact, it’s quite good for you. You get a lot of protein, plenty of nutrients, and true satisfaction. All of those are important, but I often judge by the final quality. It’s the satisfaction that captures my imagination. Maybe you won’t believe the following, but it’s true. Between the writing of the last paragraph and this one, I actually got up and made myself a bowl. Yes, it’s that good. One of the reasons it’s so good is because of the tangerine juice, made by a Florida juice company called Noble Juice. 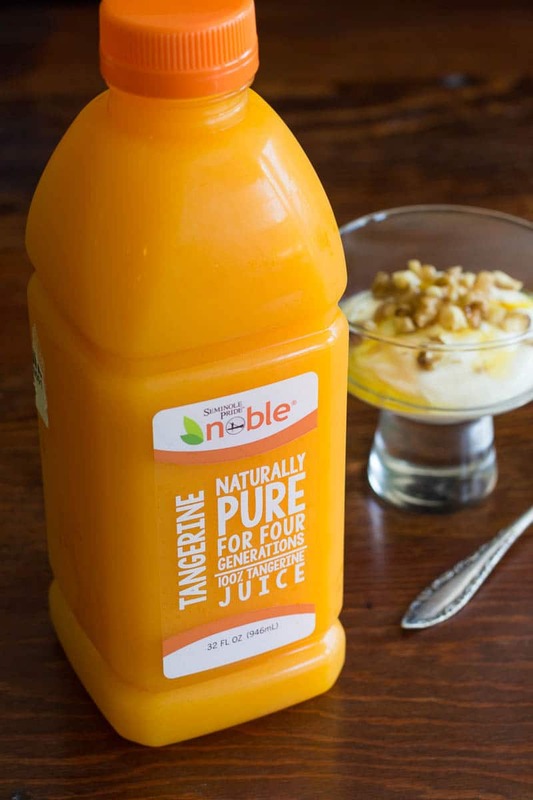 Noble Juice 100% Florida Tangerine Juice is tart, sweet, and bursting with sunny flavor. If you want to get creative, choose any Noble Juice variety to mix in to your yogurt. They’re all delicious! 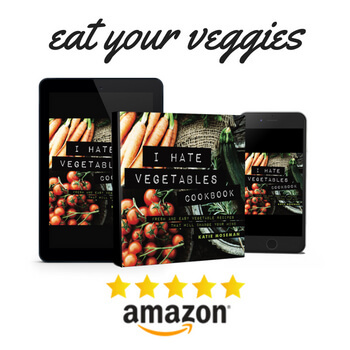 In the past, I’ve made several recipes using one of their juices as an ingredient. I made Apple Mandarin Yogurt Muffins (great for using up leftover yogurt), a breakfast smoothie, and a Strawberry Lemonade Smoothie. Now you’ve got plenty of juicy inspiration, right? So get out there and try something new. It’s refreshing to the palate and the spirit! I use plain 0% fat Greek yogurt, but you could use any type of Greek yogurt that you like, whether it’s 0%, 2%, or whole. Out of walnuts? No problem. Use pecans or slivered almonds. Choose your own level of sweetness. Some like it more tangy, others more sweet. It’s entirely up to you, so don’t be afraid to taste and adjust as needed. The type of honey can be a real revelation in a simple recipe like this. Look for single variety honeys, such as orange blossom, tupelo, or sage, to taste the amazing flavor qualities in each type. A refreshing yogurt to give you a little sweet and a little salty flavor. In a bowl, stir together the yogurt and juice until smooth. Add the honey and stir again. Taste the yogurt and see if it is sweet enough; if not, add a little more honey. Garnish with walnuts and drizzle with extra honey if desired. Serve immediately. If you like yogurt, be sure to try these fruit and herb pairings with Greek yogurt! The words “yes please” come to mind when seeing that first picture. Whoa that looks delicious. It looks simple yet full of flavor. Those are my favorite kind of recipes. Pretty sure I’ll be trying this soon! I hope you get to try it out! It’s remarkably flavorful. I’ll be looking for this juice in my grocery store. This is the perfect afternoon snack! I make a delicious dressing using a fruit juice, these Noble would be great in that recipe! Tons of flavor, love it! If I had the ingredients, I would have gotten up and made one right now!! 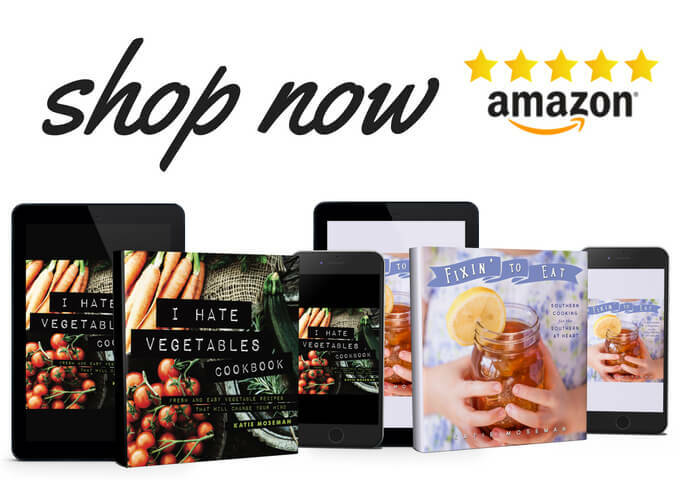 I’d love to see your dressing recipe! What a great way to flavor your yogurt! Brilliant! That sounds amazing. This is one of the most healthy and delicious snacks I’ve seen in a while. 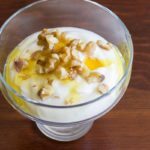 Yogurt has a ton of protein, calcium, and probiotics, honey is a wonderful alternative to sugar, and the walnuts have healthy fats. And let’s not forget the tangerine juice. Yummo! Love how simple this recipe sounds. Who knew to add juice with yogurt. Looks like a refreshing treat! Thanks for sharing. I’m a vegetarian but I have a really bad sweet tooth. I’m always looking for desserts that are healthy like this one and are also high in protein. I love Greek yogurt and tangerines so I’m adding these ingredients to my shopping list to make this recipe soon. Thank you for sharing. Yup, if you’re in search of protein, this definitely works. There’s quite a bit of it in the Greek yogurt! I’m really not a fan of walnuts but it looks like these mixture of ingredients are a perfect combination. Plus, it’s really healthy and good for the body. The tangerine juice I want to try. It looks refreshing! It is very refreshing. A different flavor from orange juice, which is a nice change. I’m not sure that I’ve ever actually seen Tangerine juice. Now I am anxious to try it, because this combination sounds amazing! One of my favorite snacks is greek yogurt (the kind I buy is already lightly sweetened with honey), but I never thought to change it up! Really? Maybe we’re spoiled here in Florida. 🙂 I’ve seen tangerine juice in the store for years. that yogurt looks so so tasty! My kids love yogurt and eat it nearly every day. This flavor combination that you have here sounds like one they would really really like. I love that you put nuts on top, yum! My kids loved this combo- although without the nuts! They’ll eat nuts separately, but don’t like to have them in anything. Almonds or walnuts are the only toppings I want on my yogurt. This one looks so yummy. I can have this for breakfast or snack every day. 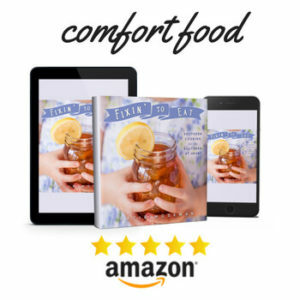 Thank you for sharing the links to the recipes. I love both almonds and walnuts, too. Toasting them makes them even better, if you have the time to toss them in a pan. I don’t think I have ever seen Tangerine Juice before! This sounds really yummy. I have fallen in love with greek yogurt lately so I will have to give this a try! This sounds so delicious!!! Thank you for sharing!